With the official ballots out of the way, it's time for The Crossover to highlight the finer points of the game and focus in on alternative awards. Here, we discuss LeBron's blocked shot, Brook Lopez's three-point bombing and more. As the regular season crawls to a close each spring, the hypothetical awards ballots are out in bloom, with the cases for MVP, Rookie of the Year and All-NBA teams debated ad nauseam. The population long ago split itself into Team Giannis and Team Harden. Trae Young stans are re-litigating the case against Luka Doncic. Finding the third-team All-NBA guards is a common parlor game. So with the playoffs arriving on Saturday, we wanted to take the time to dole out some more niche awards for the 2018-19 season. Without further ado, here are the NBA Alternative Awards, providing the most obscure honors from the regular season. This isn’t exactly the superlative we imagined giving LeBron James when he signed a four-year deal with the Lakers in July. Even as the Warriors remained heavy favorites in the West, most believed Los Angeles was a playoff team, with the potential to unleash another string of postseason memories from James. Just last year he buried Indiana and Toronto with game-winners, and damn near created an Iverson moment in Game 1 of the Finals against Golden State. Maybe LeBron would tear through Portland in April, or battle Houston in May. A conference finals appearance wasn’t out of the question. Los Angeles entered the season with dreams of Anthony Davis. It instead got a lot of Alex Caruso. 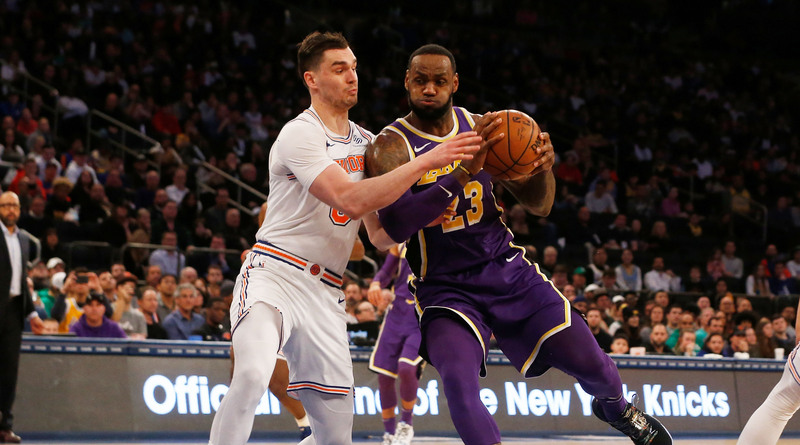 The Lakers crumbled post-Christmas, battered by a combination of bad injury luck, poor roster construction and a barrage of leaks and trade rumors. The first two aren’t LeBron’s fault. The third certainly is, and could cast a pall over the rest of James’s Los Angeles tenure. There are no shortage of lowlights to choose from this dismal year, so much so that a beautiful compilation took over Twitter in late March. But LeBron’s last-second failure at Madison Square Garden stands above them all. The LeBron of a previous era (even the 2017-18 edition) would have rose above Mario Hezonja to get a clean look at a game-winner. But lumbered by injury and the slog of a sub-.500 season, James remained restrained by gravity, his shot swallowed up by a lottery bust. It was a perfect encapsulation the Lakers’ season, and potential fuel for James in year two with Los Angeles. Don’t declare the King dead just yet. We shouldn’t shame Sexton for his defensive struggles. The rookie adjustment is difficult for a 19-year-old. Yet while Sexton’s effort wasn’t bad, his results certainly were, historically so. Sexton is just one of 17 players since 2000 to have negative defensive win shares (minimum 1,300 minutes) in a single season. Of those players, Sexton has the second-lowest number of defensive win shares (-0.5), ahead of only former Cavs coach Tyronn Lue in 2003-04. Sexton was a worse defender this season than 5’5” point guard Earl Boykins in 2002-03, Steve Blake in 2005-06 and Isaiah Thomas in 2012-13. Sexton’s defensive season ranks among the worst in NBA history. Perhaps the nickname Young Bull is a misnomer. Sexton was effective on the offensive end after the All-Star break, scoring 20.8 points per game on 41.3% from three. He has the outline of an effective point guard, and his teammates gained trust through the year after a rocky start. The Alabama product is an asset for Cleveland moving forward. Even an incremental improvement on the defensive end will go a long way. 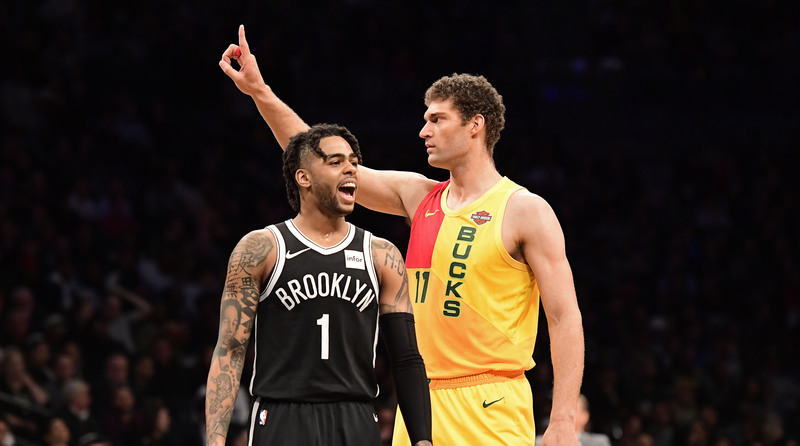 In the first eight years of his career, Brook Lopez attempted 31 threes. This year, he’s launched a whopping 512. Not even after a relative embrace of the three-point line over the last two years can compete with Lopez's new approach. He is launching triples without a shred of consciousness in 2018-19, empowered by Mike Budenholzer to be the ultimate stretch five. Only 16 players in the entire league have attempted more triples this year, and just one non-guard or wing player has attempted more (the transformed Blake Griffin). Lopez has made 13 more threes than Kyrie Irving and 26 more than Danilo Gallinari. Dirk Nowitzki’s career-high in attempted threes is 390. Splash Mountain blew past that mark in February. The sheer volume of Lopez’s threes is astounding. His range is a whole other story. Lopez is shooting as if he’s a 7’0” Steph Curry, gleefully slinging daggers from just in front of the Bucks logo. Lopez has 36 made threes from 28-plus feet this season, only three fewer than Harden. LeBron thrived while using Channing Frye as a stretch five during his second stint in Cleveland. Lopez is proving to be a supercharged version of Frye in Milwaukee, acting as a perfect center to pair with Giannis Antetokounmpo. Everyone loves a good redemption story, and Brooklyn certainly fits the bill. The Nets have slowly rose from the ashes of Billy King’s grand mistake, slated to host a playoff game for the first time since 2015 on Thursday night. Barclays Center is home to one of the few exciting non-contenders in the East, headlined by a barrage of threes, Jarrett Allen blocks, and, of course, D’Angelo Russell. Russell was known more for his cinematography skills than his basketball ability while in Los Angeles, a constant headache for the Lakers coaching staff. The former No. 2 overall pick chucked jumpers with impunity and failed to buy into the team concept. Los Angeles didn’t receive much flak for its trade with the Nets in June 2017, and rightfully so. Russell’s All-Star evolution wasn’t on the radar. His drastic turnaround has been one of the best stories of the season, and the NBA media hasn’t let his development go unnoticed. A swarm of profiles emerged as All-Star Weekend approached, telling the tale of a reformed kid with a magic floater. A change of coasts has led to a revised narrative. Russell will cash in with a big contract this summer, but he could be in for some regression in 2019-20. He’s among the toughest shot takers in basketball. His game is full of off-balance floaters and rainbow threes. A dip in shooting efficiency could represent a step back for Brooklyn. Russell should cherish the spotlight now, and be thrilled he’s no longer known as the guy next to Swaggy P.
Minnesota’s season basically ended the second Jimmy Butler said, “you f---ing need me,” during a October practice. After that, Timberwolves fans prayed for Butler to be dealt and Tom Thibodeau to be exiled to ESPN. They got their wish by January, but the future isn’t exactly sterling without Butler and Thibodeau. 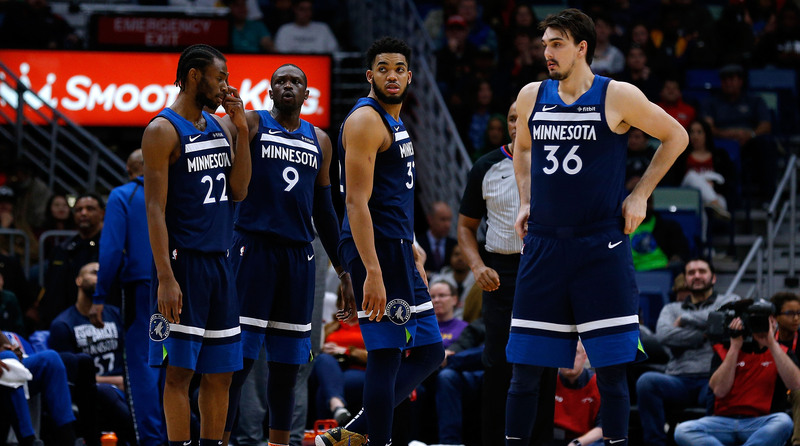 Ryan Saunders looks ready to lead a winner, but Minnesota’s talent is unlikely to cooperate. Andrew Wiggins is as disappointing a Robin as you can buy for $148 million. Robert Covington is a nice three-and-D wing, but not much else. Derrick Rose’s ceiling is limited. There’s not much to get excited about aside from a year of growth for Josh Okogie. Could Towns end up like Kevin Garnett, toiling through his prime amid an insufficient supporting cast? KAT certainly held up his end of the bargain post-Christmas. The former No. 1 overall pick poured in 27.0 points and 13.2 rebounds per game in his final 44 contests, shooting 41.6% from three. Shaq, Moses Malone and Joel Embiid are the only players since 1980 to average 27 and 13 in one season. Embiid is the only one of those three with more than a single three-point make, and he’s only converting 30% of attempts from beyond the arc. Towns has fully earned the unicorn designation. It’s unclear where the reinforcements are coming from. The situation in Minnesota could get worse before it turns around. The Butler experiment brought a cheap playoff appearance. Imagine there was no trade and Lauri Markkanen played with Towns, now that’s a fun twin towers. Instead, Towns will have to feast largely alone, aiming to carry a lackluster squad to the playoffs. He’s not absolved from fault, especially with his defensive shortcomings. But such an offensive force missing the playoffs is an undoubted bummer. If Orlando steals a game off Toronto in the first round, it will likely be due to a big night from Nikola Vucevic. Amid a crowded log jam of bigs, the Swiss 28-year-old has stood out among the trees for head coach Steve Clifford this season, leading the Magic to their first playoff appearance since 2012. A career year came at a perfect time, with a big payday likely arriving as a free agent in July. Gauging the market on Vucevic is a touch difficult. He could cross $100 million if the right suitor strikes. Dallas is the most intriguing destination, and the Lakers make a degree of sense. Yet the biggest payday will likely come from the hometown Magic. Vucevic has been a core piece in Orlando for seven years, and he's shockingly fifth on the franchise list in points. He’d likely pass Jameer Nelson and Tracy McGrady if he stays in 2019-20, trailing only Nick Anderson and Dwight Howard. Orlando could steer into the youth movement and hope the Mo Bamba project improves next year. Jonathan Isaac could be an ideal small-ball five, and Aaron Gordon is on a team-friendly contract. That path seems misguided. Finding a trade partner for Gordon would be a better antidote to the frontcourt gut, and banking on Bamba is a risky proposition. After a half-decade of turmoil, relying on Vucevic’s steady production is worth the price tag. Nearly $200 million could be heading his way.